Dan and Lex reach back to the beginnings of the Judaism Unbound podcast, providing a look back at some of our foundational concepts for those who may have started listening recently. They also ask big questions about Jewish funding, ranging from "Who is a funder?" to "What is Jewish giving?" (0:01 - 25:48): For the first half of the show, Dan and Lex reach back to the foundation of our ongoing conversation. They re-introduce the idea of disruptive innovation and share the lens through they believe it can be applied to Jewish life today. They also continue a conversation started by Andres Spokoiny in the previous episode, looking at the ways in which Judaism is in the midst of a transformation. In looking at these big-picture questions, they respond to a few frequently asked questions that they have received via email from listeners to the podcast. (25:49 - 35:48): Dan and Lex pivot to look directly at questions related to funding of Jewish organizations. In doing so, they look back at Jewish history (including a look at "Jewish mega-donor" King Herod) and suggest ways that we can learn from that history in our own time. (35:49 - 45:38): Lex discusses his own experience with a fairly new form of philanthropy -- a Jewish giving circle. He and Dan think about ways that forms of philanthropy such as that one, along with crowd-funding online, are drastically shifting what it means to be a "funder," along with what "Jewish giving" may look like in the future. The idea of disruptive innovation (and the related idea of sustaining innovation) are phenomena that we refer to frequently. For those who wish to learn more about the meaning of these terms, we recommend a number of works written by Clayton Christensen, who pioneered these understandings. 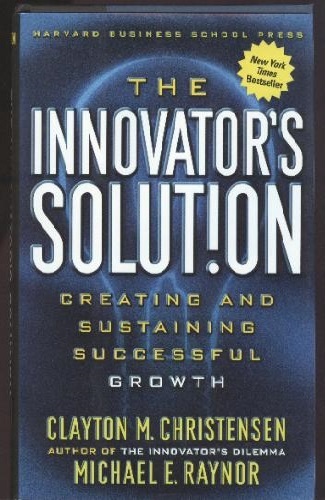 In particular, we would highlight his books The Innovator's Dilemma, The Innovator's Solution, and his recent work Competing Against Luck. Lex mentions his participation in NATAN's Giving Circle Incubator (Amplifier). If you would like to learn more about this initiative, you can access the Amplifier website by clicking here.